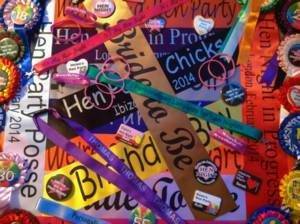 Personalised Sashes are growing in popularity for hen nights and birthdays. See below for our range of sashes. Sashes still remain popular for other occasions such as beauty contest, exhibitions, prom nights and product promotions. Our ability to be able to produce one-off sashes means that there are no additional costs incurred (unlike for screen printing). 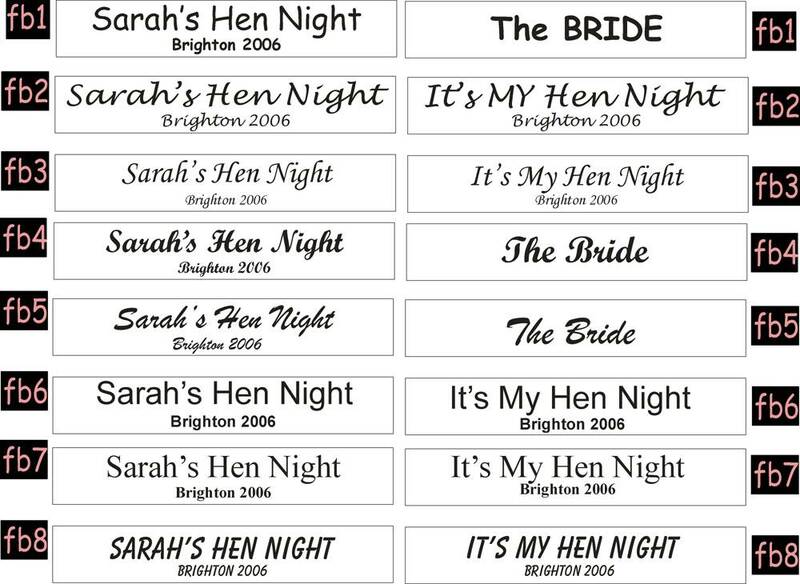 This means that if you are organising an event that you could have a different message on each of the sashes. And you would not incur any additional charges. You can select to have the print on just one side of the sash (front or back). Or you can have it on both. Examples of the layout, the fonts and the extra images that can be used are shown on the web page links below. You can also see the ribbon colours that are available. 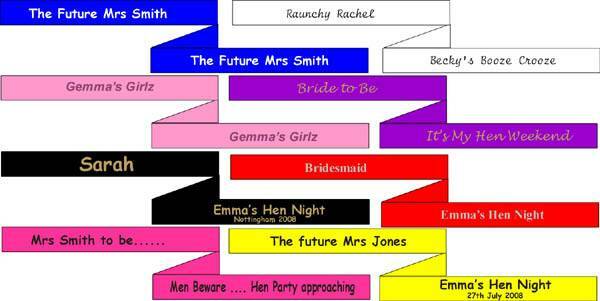 We have a great selection of ribbon colours from which you can choose your personalised party sash. The ribbon we use is a top quality polyester satin material from one of the UK’s top ribbon suppliers, Depending on the colour chosen, there is also a choice of font colours. For the darker ribbon colours, such as purple and black, then we would highly recommend using our silver or gold metallic foil. The contrast between the dark ribbon and the shiny metallic text gives a top quality appearance. For the lighter colours, then black is always a popular choice, although the metallic colours also look good. Our personalised sashes are sealed with a male and female hook and loop fastener (similar to Velcro(R) which you can attach to the ends of the ribbon. This ensures the best fit for your sash. If you require sashes that are shorter or longer than average then please let us know. The standard lengths are 6 feet (1800mm) and 4″ wide (100mm). We can also add an image to the sash e.g. from a photograph. Unfortunately we cannot produce an image of photographic quality but on white ribbon with black ink we can produce a basic monochrome image. Examples of this are shown our the web pages. 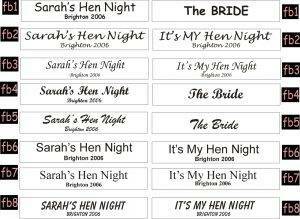 We also have a small range of off the shelf black sashes with white flowing text and which are available with 3 different wordings. Note these are a cheaper option but cannot be customised. View our other products here.